What It’s About: Dr. Paul Carruthers (Bela Lugosi) is the beloved town doctor of Heathville, a cosmetics factory town outside of Chicago. Carruthers is a cosmetics genius whose cold cream formula was the foundation of the Heath-Morton Cosmetics Empire. Carruthers feels that Henry Morton (Guy Usher) and Martin Heath (Edmund Mortimer) owe him more than the $10,000 and steady employment they’ve given him and so Carruthers seeks revenge. His method? A bat he’s grown to nearly man-size and given a hatred of a specific scent. He works that scent into a cologne which he gives to his victims-Heath and Morton’s sons-before letting the bat loose into the night. Somehow the bat always finds its victims, who just happen to be walking outside at night. Never fear! Ace-reporter Johnny Layton (Dave O’Brien) is on the case along with his comic-relief photographer “One-Shot” McGuire (Donald Kerr), and they soon manage to pause long enough in their attempts to woo heiress Mary Heath (Suzanne Kaaren) and her French maid to see the giant bat themselves. Can Layton figure out who’s behind the murders before it’s too late? Why Watch it Today? : Tonight is International Bat Night, a worthy event celebrating this maligned animal. 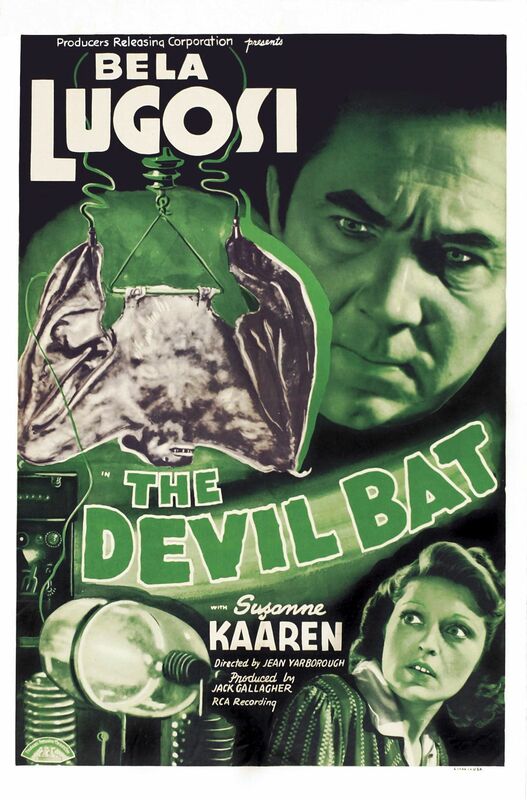 That being said, this film is too sublimely ridiculous to pass up as our International Bat Night Movie of the Night, despite the fact that an embiggened, cologne-seeking bat is the instrument of Bela’s revenge. This entry was posted in Animals Attack, Black and White, Horror, Independent, Mad Scientist, Movie of the Day, Revenge, So-Bad-It's-Good, The Original and tagged Arthur Q. Bryan, bad special effects, bats, Bela Lugosi, cologne, cosmetics company, double cross, embiggened, evil businessman, French Maid, insanity, low-budget, perfume, photographer, Producer's Releasing Corporation, radio show, reporter, revenge, sins of the father.